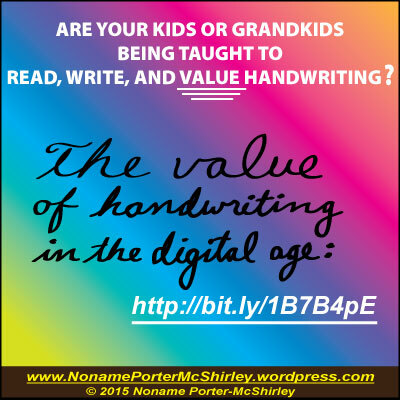 Do Your Kids Know the Value of Handwriting In the Digital Age? Handwriting is far more useful than probably most people realize in this age of smart phones, Tablets, iPads, and school-issued computing equipment. I want to inspire you to think about what useful skill your kids or grandkids might be missing out on, unless you help them. And helping them can be easy! Before digital equipment was everywhere all the time, ordinary people had to write out homework, write out shopping lists, leave personal notes to each other, jot down phone messages, fill out job applications, write personal letters of correspondence, and many other things—all by hand. Once drafted by hand, finished business documents and letters where usually typed on a typewriter for a neat appearance, but even professionals kept daily records and accounting by hand. The smoother and faster a person could write by hand, the better their life ran and the better the impression they made on other people. Now, almost every form of communication to oneself or anyone else is done by typing on a digital device of some kind, and everyone is constantly connected with texting, Tweeting, Pinning, Flikr-ing, emailing, occasionally cell-phoning, and there are a host of other “online” applications popping up to make sorting, storing, sharing, and using endless information supposedly easier. When does anyone write more than three words by hand? . . . And when people do write with a pen or pencil, many people don’t use cursive because they never learned the awesome advantage of cursive—SPEED. Writing by hand is technically handwriting, but when each letter is formed individually it’s called printing (the words look like a sloppy version of machine printing). The best handwriting is called cursive—that’s the kind that flows with every letter of a word connected to the next letter. What people are missing out on is the speed of cursive handwriting. Evidence that the usefulness of handwriting in the digital age is not widely understood. In recent years some schools stopped teaching cursive handwriting. Whether your school has continued, stopped, or started it up again, you may want to take note of the issue and personally show your kids or grandkids the value of handwriting so that they can enjoy the benefits throughout their lives. I’ve seen professional adults who have trouble writing by hand, but occasionally have to do it. If you’re one who is so familiar with cursive that you use it without thinking, you may not realize that it is not guaranteed for the next generation. Imagine if the subject of math was canceled because calculators are everywhere? Ridiculous. Imagine the inconvenience of shopping or cooking if you couldn’t do simple math in your head. It’s up to us to make sure our kids are learning the skills we take for granted. If handwriting in cursive is presented as just another thing that must be memorized, it will be unappreciated and tossed aside by the child as soon as possible. Someone must show kids not only how to write in cursive, but how fast it can be done, and also point out how much time the method can save for the child in the months and years ahead. 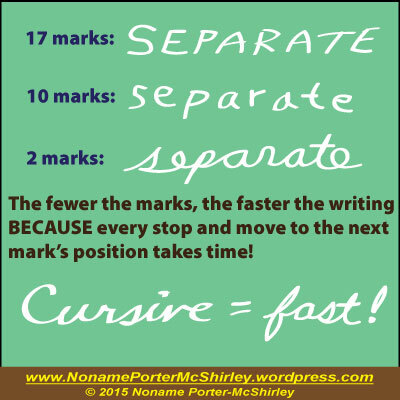 Why is cursive so fast? Because it is designed so that your writing instrument seldom leaves the page—every word is made with ONE flowing line. When printing by hand, every letter is made of at least one separate mark, many require two marks, and an “E” is often done with THREE separate marks. The word “separate” takes SEVENTEEN marks to print in all caps, or TEN marks to print in individual lowercase letters, but only TWO to make in cursive! Cursive is like rolling down a hill on a skateboard, and hand printing is like taking all the steps to walk down the hill. If you just want to get to the bottom so you can play, you’ll take the skateboard—provided someone has shown you how to use it! BONUS: Cursive is so flowing that it does not feel tedious like printing can. Try writing an entire page by hand with lowercase print, and all those little movements will likely make you feel like throwing down your pen and shaking your hand. Once you’re practiced in cursive however, you can soar through handwriting an entire page easily and comfortably. 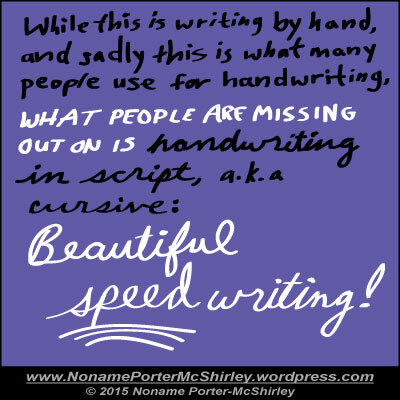 So why care which is the fastest way to hand write when we type everything? Two points: we type more than we would if we knew how to write super fast; and we need to be able to cope better when batteries fail, programs crash, or devices are too expensive. I’ve had people tell me they lost everyone’s phone numbers and addresses because their phone messed up, but that wouldn’t have happened if they kept a written address book as backup. How much time do you spend entering info into an electronic device when you could jot it on a piece of paper and stuff it into a pocket? I’ve heard things on the radio I wanted to look into, and reached for a pencil and paper to take notes faster than I ever could have opened an appropriate program on a computer or smart phone. Maybe students think they can type notes while listening to a lecture just as fast as someone could hand write notes, but what about when they show up only to find out that their laptop battery died, their word processing program froze without saving, or the operating system crashed? What about when their computer is so old that it becomes too slow, but they can’t afford a new one? Everyone should have the ability to handwrite as a backup. If people knew how to write well and fast, they wouldn’t be so concerned with somebody paying to ensure electronic devices are everywhere! And once we have the ability to write smoothly, quickly, and easily, we will not only find it’s nice to give and receive notes and letters that are personally written rather than digitally delivered, we’ll also find ourselves writing all sorts of little notes, signs, lists, etc. You have to be able to do something before you discover advantageous opportunities for doing it. When someone can’t cook, they eat prepared meals and think it’s fine; but once they learn how to cook something fresh and wonderful, they realize they like it better. People who can’t read manage somehow to get through life, but those of us who know how to read also know the advantages. There are advantages to knowing cursive! Making sure your kids or grandkids learn cursive can be fairly simple. If you are not very fast with cursive yourself, practice a little before talking to your child about it. Once you’ve got it down, pick a few words–anything–and have the child write them. If you have a clock that shows seconds, time the child’s writing; but if not just have the child mentally notice how long it take him or her to write, compared with how fast you can write the same words. After the child writes the words, you write them first in print (individual letters) and then even faster in cursive. When you do the cursive, do it as fast as you can, legibly but without trying to be pretty—act like someone is talking and you have to write as fast as they talk. Your child should be amazed at how much faster you can write then he or she can, and that will be the key to getting cooperation. Remind them that they will spend less time writing and more time playing, if they learn such a fast writing method! Point out to your child every time you write something. When you write a check, add to the grocery list, post a sticky note, whatever—so the child sees that there is writing to be done in real adult life. Hopefully your child will be excited to learn, but if the child protests learning cursive handwriting, simply tell them they absolutely have to do it. Mater of fact. No arguing. You know it’s worth their time, and they will know it too once they learn it. Don’t make it a drudgery by insisting on too much practice—copying one sentence which uses all twenty six letters is enough for each session. You’re trying to convey that cursive writing is faster than the alternative, so practicing it should also be a brief chore. Then start looking for times to have your child write one or two words in script, like having them add an item to the grocery list for you. As the child uses cursive several times per week, they will get used to it and begin to like it. When my son was little, he endlessly whined and fussed about it being a waste of time to learn cursive when he already know how to write. But I made him practice just a sentence or so at a time, maybe a few times a week. I can’t remember how many weeks it took, but once he had the cursive form of every letter of the alphabet well memorized (including how to connect them to each other), there was no going back—he CHOSE to write EVERYTHING in cursive, because it was SO much faster for him. I even had to show him that on certain types of projects, for visual clarity, he should hand print the words rather than use cursive (like for document titles, or for when he had to write extremely small). Cursive has become my standard example when he doesn’t think he will ever need or want whatever it is that I’m telling him to learn. He even feels sorry for his young friends who, because they haven’t mastered cursive, can’t read what he’s written and also struggle with their own homework or other projects. Give your child or grandchild the gift of knowing cursive handwriting.